A basenji will not normally have glucose (simple sugar) in his urine. If glucose is present it is likely the basenji has Fanconi syndrome. It is also possible the dog is diabetic, but this is less likely. In any event, detection of glucose should prompt a visit to your vet. The reason we test for glucose in the urine is to catch Fanconi disease as early as possible when it is easiest to manage. The basenji community of breeders and enthusiasts cannot yet predict which dogs are at risk. This is why it is recommended that basenji owners test their dogs monthly for glucose between ages 3-11.
bottle of glucose test strips. These are glucose test strips. You can get them from most pharmacies. Ask for Bayer "Diastix" or equivalent. There are several other brands and they all have the same form and function. Other descriptive terms are "diabetic test strips", "glucose test strips". Some are multi-function such as "Keto-Diastix" (measures glucose and ketones). These will work as all you are concerned about is the ability to measure glucose. Be careful not to get Ketostix or strips that measure only ketones. Open the bottle and examine a test strip to familiarize yourself with it. Notice there is a "business end" which has a turquoise pad. This is the end that contacts the urine and detects glucose. It has a chemical which changes color in the presence of glucose. You hold the strip on the other end with your fingers. Read the instructions on the bottle carefully and note the glucose color chart on the bottle. For Diastix it looks like this. Notice the "negative" color is the same as the fresh test strip. As a practical matter, you are only interested in if the color changes or not, rather than the degree of change. The diastix change from blue to green to brown when exposed to glucose. Note the delay time you must wait before reading the strip. For Diastix, it is exactly 30 seconds. Now that you have your test strips, clock, dog, lawn, and saucer, it is time for the fun part: collecting the urine. The good part is you only need a few drops. Take your dog out to the lawn and have him do his or her business. In mid-stream, slide the saucer in the stream and collect a squirt of urine. The flatness of the saucer works well for sliding under a female as she squats. Try to get the later urine rather than the first squirt. Avoid getting dew or other contaminates from the grass in the saucer. When done, secure your dog and take the saucer inside to do the test. You should have something like this. YUMMY. Next dip the stick as shown into the urine and tap off any excess. Note the exact second you did this and wait the specified time. At exactly the specified time, compare the color with the chart and see if it changed from the negative color. If the color stays the same, that is it, you are done with the procedure. Be aware that with most basenjis the color will never change -you are merely taking a reasonable precaution by doing this test. Consider it a normal part of your dog's health maintenance. Frequency of test should be once a month. In addition, many owners like to test twice over a couple of days to guard against a false negative reading. 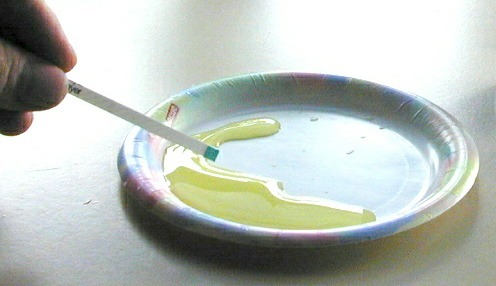 With experience, some people have been able to dispense with the saucer and dip the test strip right in the stream. This is obviously easier to do with a male. What to do if the color changes. In the above photo, the bottom two sticks are examples of glucose positive. If the color changes with your dog's urine, you should do a retest with some fresh urine the next day. If the color still changes, it is time to see the vet. Your basenji may have Fanconi syndrome. Download and print out this Fanconi management protocol for veterinarians (pdf format) and take to your vet. It is written in the appropriate technical jargon that vets recognize. Since Fanconi is rare outside basenjis, your vet may need this document to become familiar with the illness and treatment. At some point, you may wish to make sure your test strips are functional. This can be done by dissolving 1 drop plain honey in 1 tbs. water or 1 drop Karo syrup in 1 tsp.water, and then test the solution. Both of these products have ingredients identical to glucose and will change the strip color. Do not use table sugar which is of a different molecule and will not change the strip.